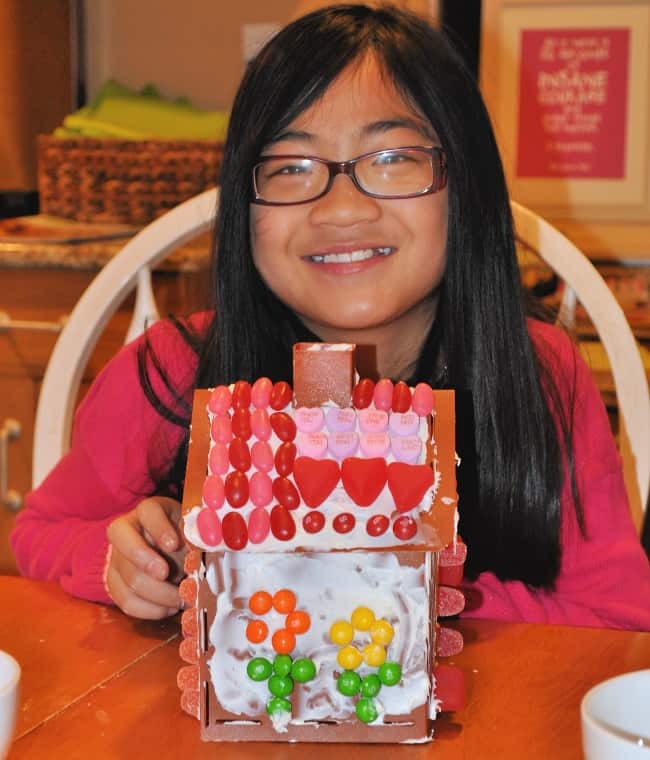 Have you ever tried to bake gingerbread house pieces from scratch? And then glued them together with royal icing in the hopes that the walls were somehow square-enough that they would actually stand and support the mounds of holiday candy that your kids were going to use as decoration? Me too! And it was a lot of work! 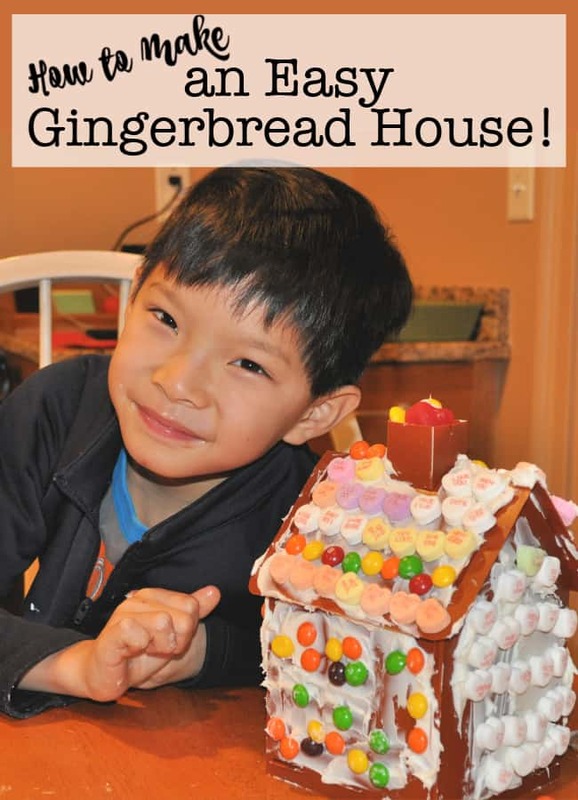 So how about I offer you a shortcut this year and show you how to make an easy gingerbread house instead? 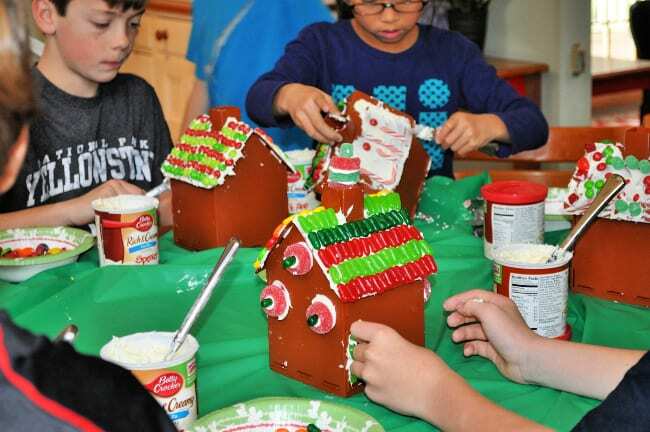 When it comes to gingerbread- I've learned that my kids prefer to eat a soft gingerbread cookie over trying to break off a bite from a hard gingerbread house. Which is why we never actually ate our home-baked gingerbread houses. So why the heck was I spending hours making them from scratch? 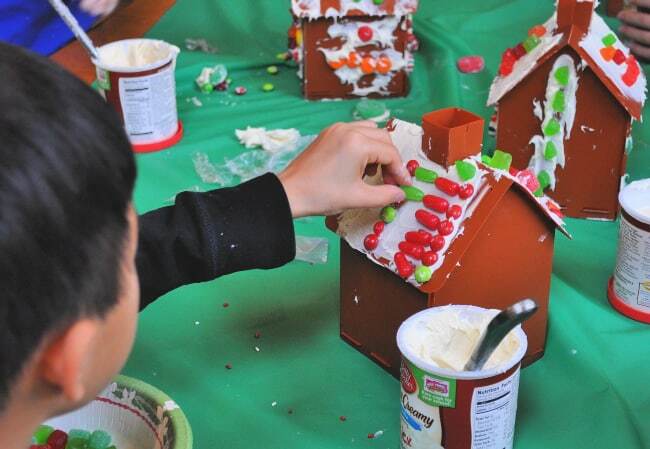 The real fun of gingerbread houses is in the decoration anyway! And stealing little pieces of candy while you are executing your design, right? So I've decided to “cheat” a little from now on- and use plastic gingerbread houses! 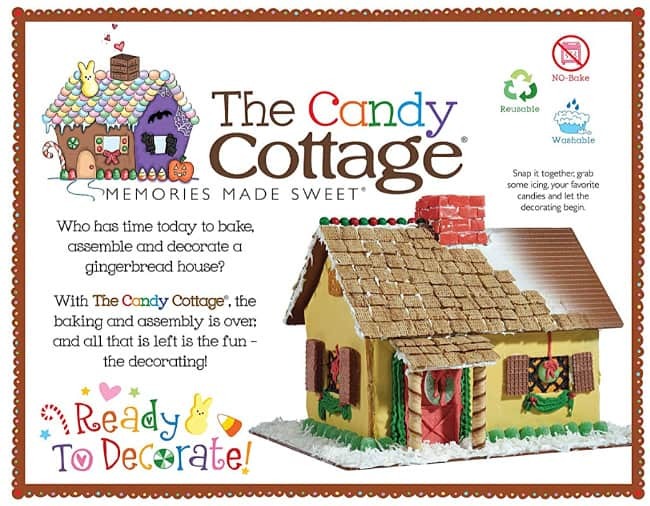 We purchased our plastic gingerbread houses a few years ago- so the design is a little different now- but these Candy Cottages This is an affiliate link: MomOf6 earns a commission if you purchase, at no additional cost to you. are perfect! The new ones are 11″ x 14″ making them large enough that two kids can decorate the same house. And the best part is that they can be used over and over again year after year! 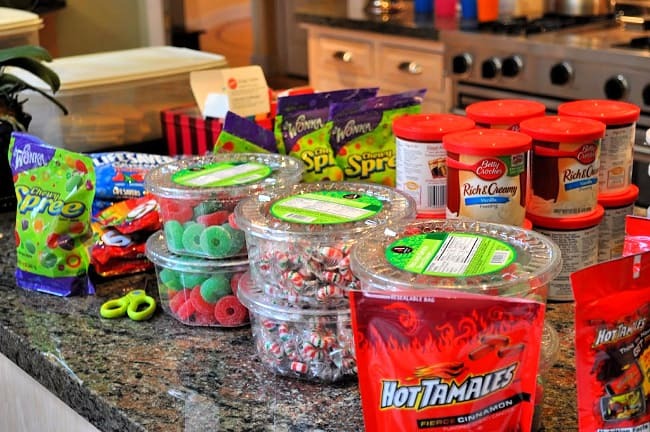 Start by scoring a great deal on candy! And don't even bother making royal icing… just go with store bought containers of white frosting! At first the kids doubted whether or not the frosting would really stick (it did!) and whether or not this would be fun at all (it was!) and then they got to work creating the cutest gingerbread houses that we've ever made! I have to tell you- with all of the busyness of getting ready for the holidays- this felt like the first time that I've truly relaxed, listened to the holiday music we had playing in the background, and felt the joy, fun, and family of the holiday season. After the holidays, I will simply soak the plastic houses in hot water, discard any remaining candy, and put those plastic boxes away until next year when I can use them all over again! How great is that? 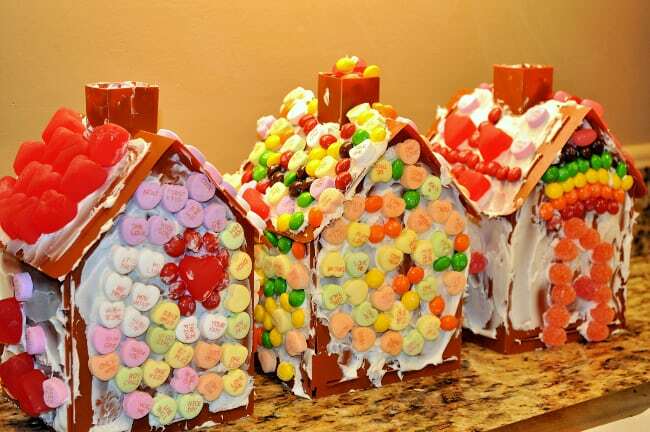 Of course- you don't have to wait for the Christmas season to decorate gingerbread houses, we've made Valentine's houses too with our Candy Cottages This is an affiliate link: MomOf6 earns a commission if you purchase, at no additional cost to you. ! Free Printable Christmas Mad Libs! Best Suggestion EVER!!!!!!!!!! You described my reasons for not doing gingerbread houses perfectly, yet my kids ask for them every year. Thank you SO much! Thanks Rebecca! Glad to give you the easy way out! Those candy houses are adorable, Sharon. It’s a whole candy neighborhood! That is easy! We resorted to the store bought gingerbread pieces since I just don’t have a kitchen to make them in. My kids do eat the gingerbread. Our tradition is to break into them at the stroke of midnight on New Year’s … and then they get to eat a chunk of it. Most of it does go in the garbage though. Merry Christmas! They look great!! So much easier than the originals. Looks like they survived the change in tradition. Yes- I would say we have now started a new tradition! What an awesome idea! The kids look like they had a ball even though they were at first skeptical. They look beautiful on your table! Nice work, Sharon. You are SuperMom! I think they look awesome on the table too! And today the “S” on my mom-cape stands for “Shortcut Mom”! Way to make life easier Sharon – love them! Thanks Amy! Now if I could only figure out a way to short-cut all of the present wrapping that is ahead of me this week! I’m thinking of putting all their stuff into one large box for each person and then just wrapping 1 big box.